Recently I stumbled across a new company who is not so new. 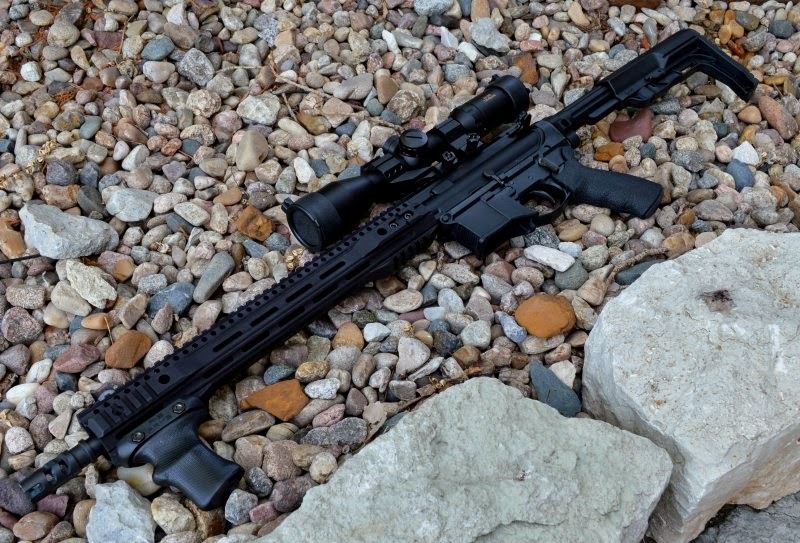 AB Arms has actually been making AR15 related parts for a number of years for some of the top major companies in the US and even internationally; two of those companies are rumored to be Mossberg and LWRC. 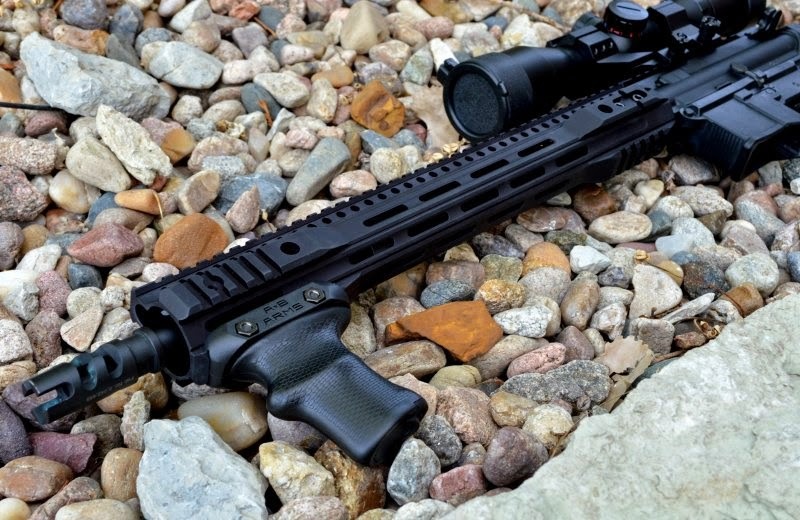 AB Arms delivers bolts, extractors, ejectors, handguards, and accessories such as this T-Grip to high volume contracts via a mix of exclusive strategic partnership manufacturing agreements and in-house manufacturing capabilities. The result is that this company you probably have not heard of is handling the parts production of some significant players in the firearms industry. My focus was to test out the short and stubby SBR Forward T-Grip was designed initially for the IWI Tavor but can also be used on any AR15. At this point, I do not have a picatinny on my Tavor, however I do have a blank space on a recent AR15 build which needed a compact forward grip and this fit the intent of that build perfectly. Generally I am not a forward grip kinda guy, however I do like them for some purposes. The longer forward grips can be used as makeshift monopods and the short stubby ones could be used as hand stops, indexing, or bracing points. In the case of this build, I really wanted a snag free foreword short grip. After shooting this grip on a few guns at a recent industry event, I picked up a $39.00 AB Arms T-Grip for this build. For this build I used a Polymer80.com lower receiver (finished by yours truely), PWS premium buffer tube assembly, Mission First Tactical Minimalist buttstock, Aero Precision Upper, WMD NiBo Carrier, Sharps Relia-bolt, Aero Precision Lightweight 5.56 Barrel, PWS Brake, Parralax Tactical Gen 2 15” Free-Float forend, AB Arms T-Grip, and a Konus Pro 1.5-5 optic. The design overall is a very good rounded design which did not seem to snag on any of my equipment or bags during testing and felt very comfy in the hand. 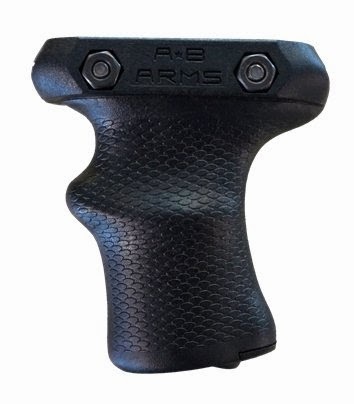 The angled grip is ergonomic for the support hand and more comfortable than a straight vertical grip. For $39.99 it a very comfortable grip for those that want a forward stop or a short forward hand support. 1. The T*Grip follows the contour of the front hand stop lip. This prevents the index or middle finger from getting “pinched” in the gap between the lip and the grip which has been a common complaint with the other grips on the market. 2. The T*Grip’s patent pending ergonomic design (i.e. 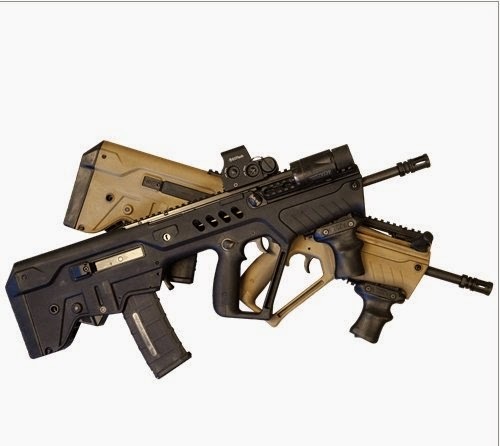 side swells) gives you positive control of the TAVOR® so that you can better drive the gun. The design prevents unwanted rotation of the TAVOR® which can be found on circular vertical grips. 3. 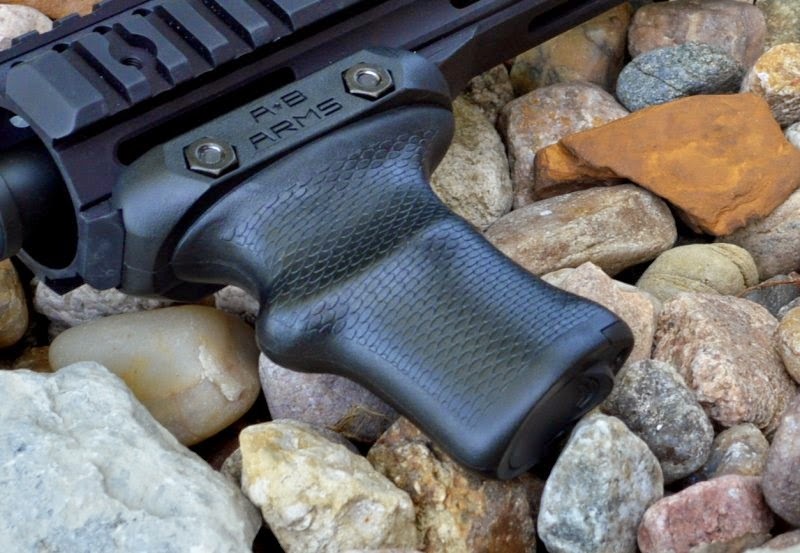 The T*Grip’s length is shorter than most vertical grips keeping it low profile. 4. The T*Grip’s slight inward angle adds less chance of catching on clothing and gear. 5. The T*Grip is made of a proprietary blend of polymer composite material with a two bolt attachment giving it extra strength. 6. The T*Grip is designed & manufactured in the USA by a veteran owned company. 7. The T*Grip contains a AA and CR123 battery compartment. 9. The T*Grip is a patent pending design.